Elizabeth River Crossings commits $120,000 for program’s first two years. 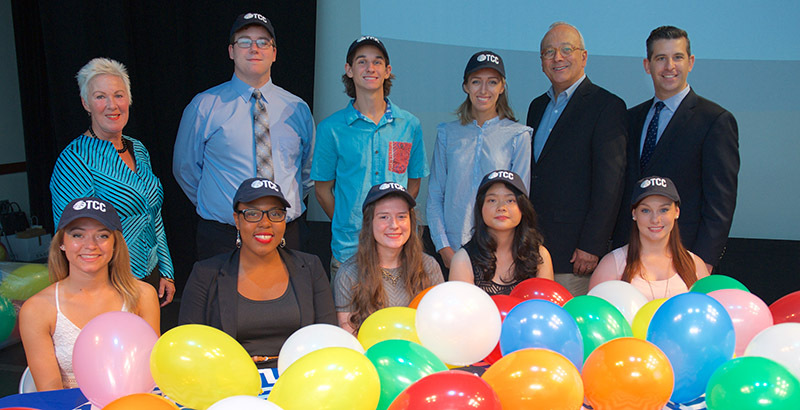 Tidewater Community College welcomed its first class of STEM Promise Program scholars with colorful balloons and celebratory drumrolls at a “signing” ceremony held Aug. 16 on its Chesapeake Campus. Ten students will pursue science, technology, engineering and mathematics-related disciplines at TCC and complete two-year associate degrees at no cost for tuition and fees under the innovative Women’s Center STEM Promise Program. Just as college-bound athletes sign letters of intent, students signed ceremonial Certificates of Acceptance. Afterward, they donned TCC caps while more than 500 balloons cascaded from the ceiling. TCC President Edna V. Baehre-Kolovani announced a $60,000 gift from Elizabeth River Crossings (ERC) to the TCC Educational Foundation to fund the first year of the program in its entirety. To her surprise, Philip Shucet, chief executive officer of ERC, pledged an additional $60,000 to fund the scholarships for a second year for the inaugural class. “I’ve worked in the construction and engineering industry my entire career,” Shucet told the scholars. “I’ve seen firsthand the contribution that people like you have made and are willing to make to help make our world a little bit better place to live in. The TCC Women’s Center STEM Promise Program is designed to boost the number of women and minority students achieving STEM degrees. Scholarships cover the full cost of tuition for up to four semesters. Glenn DuBois, chancellor of Virginia’s Community Colleges, said the STEM Promise Program fulfills the overall mission of community colleges in three ways: providing college access, meeting industry needs, and ensuring diversity and inclusion. Kolovani emphasized the goal of diversity and inclusion. Joining Shucet, Kolovani and DuBois were Aubrey Layne, Virginia’s secretary of transportation; and Mike King, chair of the TCC Educational Foundation Board. TCC alumna Carol Curtis, owner of the general contracting firm Noah Enterprises, talked about her journey to success, which began at TCC with a degree in civil engineering technology. “I came to TCC to study accounting but found my passion in dirt and concrete,” she said. Up to 20 more students will be awarded scholarships for fall 2018. Those interested in supporting the TCC Women’s Center STEM Promise Program should contact James Toscano, executive director of the TCC Educational Foundation, at 757-822-1015 or jtoscano@tcc.edu.